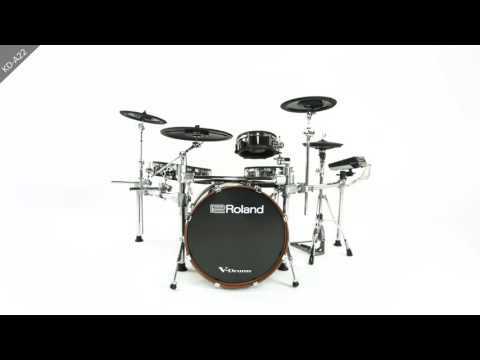 The Ultimate Roland V-Drum kit The Roland TD50KV represents a new dawn for electronic drum kits, utilising Roland's latest cutting-edge mod.. The Roland TD50KV represents a new dawn for electronic drum kits, utilising Roland's latest cutting-edge modelling technology - Prismatic Sound Modelling. The TD-50KV is the most responsive, inspiring pro drum kit available from the V-Drum series to date, featuring the KD-140 Kick Pad for unrivalled response and performance. The Roland TD-50KV’s high-resolution processing gives you the most lifelike, resonant, and expressive sounds you’ll hear from an electronic kit. The TD-50 module and new trigger pads are designed to work hand-in-hand to capture every nuance of your performance in incredible detail. This advanced module also supports deep sound customization, including basic adjustment of heads and shells, layering of internal and user samples, and adjustment of overhead mics and ambience. For tailored performance, a compressor and three-band EQ can be controlled for each pad individually, while three independent multi-effect sections let you treat specific drums with 30 effect types such as delay, flanger, saturator, and many others. The advanced processing power of the Roland TD50KV is complemented by the PD-140DS Digital Snare and CY-18DR Digital Ride, which feature multi-element sensor systems and high-speed digital communication with the module. A brand-new, three-layer mesh head is fitted to a standard size 14-inch shell for natural rebound and feel, and is instantly familiar for Acoustic players. There’s also the dynamic VH-13 V-Hi-Hat, plus the option of powerful hybrid performance by mounting a KD-A22 Kick Drum Converter on your favorite 22-inch acoustic kick. The Roland TD50KV features a USB 10-channel audio out for multi-track recording through a single USB cable. Record to a choice of audio sampling formats: 48 kHz, 96 kHz, and the standard 44.1kHz, and mix each channel independently in your DAW. Using the module’s SD card slot, it’s easy to trigger your own WAV files using any of the TD-50KV’s drum pads. You can loop or layer WAV sounds alongside the internal sounds while controlling volume and tone via the TD-50’s front panel. As a drummer, you'll know that constant practice and dedication to your technique is an essential part of going Pro. The TD-50KV has onboard features that help you get the best from practice sessions. Whether you lock down your timing with the Quiet Count function or play along to backing tracks via the SD card slot, it’s easy to get inspired, even when you’re practicing alone. The flagship TD-50 series offers a variety of kit configuration options to suit your style and needs. If you want the ultimate drumming experience, presence on the stage, and more, pairing the TD-50KV with the optional KD-A22 mounted on your 22-inch acoustic kick shell is the perfect choice. For studio recording and home practice, the compact footprint of the included KD-140-BC Kick Trigger Pad might make more sense. And if you play in home and live situations where space is an issue, you should check out the TD-50K set. In comparison with the TD-50KV, it comes with slightly smaller tom, hi-hat, crash cymbal, and kick trigger pads, as well as the smaller MDS-50K stand. Book a Demo at your local PMT House of Drums Store and speak to our dedicated Roland Experts for training, advice and the best deals on the Roland TD50KV!